Here at Car Clinic MOT Centre Ellesmere Port we don’t just do MOTS. We also supply tyres from all the leading brands. 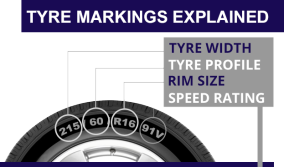 One of the popular choices is Hankook tyres – read on to learn more. Hankook Tyres manufacture globally innovative, award-winning radial tyres for passenger cars, light trucks, Sports Utility Vehicles (SUVs), Recreational Vehicles (RVs), trucks, and buses. They also supply tyres for motorsport. The company aspires to bring its customers excellence in product quality, technological excellence and driving satisfaction. They continuously invest in research and development, with five Research and Development centres and eight production facilities, located all over the world. They have bespoke tyres for the European market as well as providing OEM (Original Equipment) tyres for the leading premium car makers. Hankook employs about 22,000 people worldwide and sells their products in more than 180 countries. Many leading car manufacturers use tyres made by Hankook as original equipment on their cars. About a third of the company’s global tyre sales come from the European Union. Hankook has been part of the world famous Dow Jones Sustainability Index World since 2016. Hankook European tyres are developed in their regional Technical Centre in Hanover, Germany. Production takes place in a state-of-the-art manufacturing site in Rácalmás, Hungary which opened in June 2007. Currently, they have around 3,000 employees producing 19 million tyres every year. Hankook Tire’s European headquarters are located in the town of Neu-Isenburg, close to Frankfurt am Main in Germany. Hankook also operates branches in the Czech Republic, France, Germany, Hungary, Italy, the Netherlands, Poland, Russia, Spain, Sweden, Turkey, the United Kingdom and Ukraine. Hankook products are sold through regional distributors to other European markets. For a free Ellesmere Port car repairs quote or an Ellesmere Port tyres quote just give our friendly and professional team at Car Clinic MOT Centre a call on 0151 3390101 or pop in at your convenience. Here at Car Clinic MOT Centre Ellesmere Port we offer a professional tyre fitting service, including a full selection of tyres from budget to premium, fast expert fitting, wheel balancing and wheel alignment. Use our online tyre finder tool today or call 0151 339 0101 or 0151 339 3030 today for more info.